Colin Firth has just been announced as one of the leading nominees for Best Actor at this year's Oscars (and we think he may have it in the bag). But although he plays the last King of England in the film 'The King's Speech,' Firth makes it pretty clear he is actually anti-monarchist in his views. Appearing on Piers Morgan's new chat show on CNN, Firth admitted in the interview that he perfers a government he actually gets to vote for. Asked point blank whether he thinks hereditary monarchy is a good idea the British actor hesitated and joked: "I think they seem very nice." The actor is clear about own his political beliefs, having recently ended his public allegiance with the Liberal Democrats after becoming disillusioned with the party. Their decision to switch policy on government-backed tuition fees, he said, "Made it difficult for us who thought progressive politics would be the way forward." Firth is considered the favorite to win the Best Actor Academy Award (with strong competition from Christian Bale) at next month's Oscars with the film leading the field with a total of 12 nominations, including ones for Best Picture and Best Screenplay. 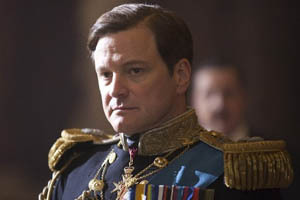 In the film, Firth plays King George VI who suffered from a pronounced stammer at a time when the country cried out for strong leadership. In an important test run, Firth won the Golden Globe Award for Best Actor for his role in the movie earlier this month.